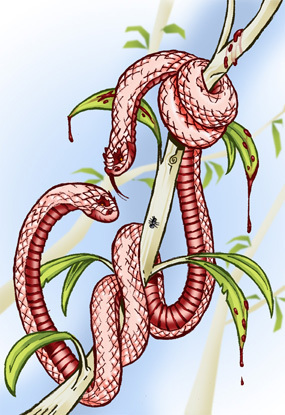 DESCRIPTION : Amphisbaena. One of a series of illustrations of lesser known mythical creatures. Debate rages on the origin of the venomous Amphisbaena, but most experts agree that it was most likely created from the blood of Medusa's severed head. Legend tells it that, as Perseus returned from slaying Medusa, he flew over the Libyan Desert on his steed Pegasus. Having not packaged her head properly, its blood rained down upon the earth, and the Amphisbaena sprung forth where ever it fell. Another area of contention is the Amphisbaena's mode of locomotion. Some claim that it has chicken legs it runs upon, while others tell of wings that enable it to fly. These two statements are most likely fiction; but the reality is that is that it either slithers in a traditional manner, or more dramatically, its two heads clasp together and it rolls like a wagon wheel.